Katherine Barry is a 2012 graduate of the College of William and Mary, Williamsburg, Virginia, with a BA in history and anthropology. Most recently, she worked at the Tamastslikt Cultural Institute, Confederated Tribes of the Umatilla Indian Reservation in Pendleton, Oregon. She expects to pursue a career in museum work and plans to attend a graduate program, using her time at SAR to determine her focus area within the museum field. While studying at the College of William and Mary, Barry was first a volunteer and later employed as proctor of the Sir Christopher Wren Building, the oldest college building still in use in the US. Barry researched and taught the history of the college and early Virginia to the public and led tours of the Wren Building and historic campus for visitors and school groups. She also participated in a six-week excavation of Ravenscroft and Davenport properties in Colonial Williamsburg and was chapter president and executive vice president of the National Society of Collegiate Scholars, William and Mary chapter. In the summer of 2012, Barry began work at the Tamastslikt Cultural Institute. As research library aid and archival project contractor, she re-housed and created a folder-level inventory of thirteen boxes of archival materials of anthropologist Theodore Stern, who spent thirty years among the Cayuse, Umatilla, and Walla Walla families. Dr. Stern’s research led to two volumes published by Oregon State University. Barry also completed research on tribal veterans for a temporary exhibit featuring the traveling replica of the Vietnam Veterans Memorial Wall at the Tamastslikt Cultural Institute at the Umatilla Indian Reservation. This project represented an enormous bridge-building exercise with the non-Indian neighboring communities. “These experiences have given me a new appreciation for the complexity of both ‘behind the scenes’ and frontline museum work. I would like to continue working with tribal communities to preserve heritage and share their history and stories in their own words,” says Barry. In 2013, as an archaeology student at Northern Great Basin Prehistory Project, University of Oregon, Barry participated in the excavation of Rimrock Draw Rockshelter stemmed point site near Riley, Oregon. At the field school, she gained experience with systematic excavation, field notes, field mapping, GPS, lithic analysis, faunal remains, and field cataloging. During her tenure at SAR, Barry will spend half of her time working on collections/registration projects and the other half working on academic/programming projects. She will be in residence at SAR from September 2, 2014-May 31, 2015. Katherine Barry. Photograph courtesy Katherine Barry. The Summer Policy Academy (SPA) at the Santa Fe Indian School and the School for Advanced Research (SAR) have had a memorandum of understanding since 2010 to support one summer intern at the Indian Arts Research Center. The purpose of the internship is to help students affiliated with the SPA gain work experience, broaden their perspectives, and learn about the museum field. The SPA and SAR are pleased to welcome Aliyah Chavez as the 2014 SAR-SPA summer intern. Aliyah Chavez is from Santo Domingo Pueblo. 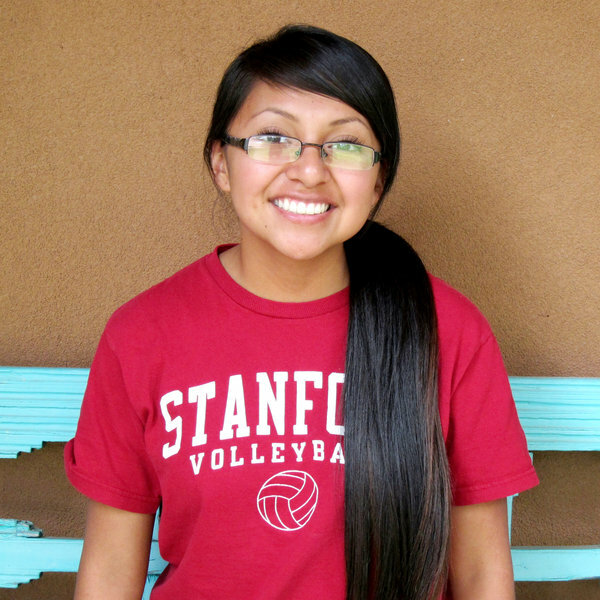 She is a recent graduate of the Santa Fe Indian School (SFIS) where she was the salutatorian of her class. She will be attending Stanford University in the fall with the Gates Millenium Scholarship. She plans to study Native American studies as well as political science. In high school, Chavez was an active member of the SFIS community and was president of her class during her sophomore and senior years. She was also a member of the National Honor Society, the Brave Girls women empowerment group, the SFIS Spoken Word team, and the volleyball team. She participated in the (MS)2 Math and Science Program for Minority Students for three consecutive summers at the Phillips Academy Andover campus in Massachusetts. She graduated with honors in calculus. As a fellow at the Summer Policy Academy, Chavez has studied Native American policy at the Santa Fe Indian School and at Princeton University’s Woodrow Wilson School of Public and International Affairs. She has a deep passion for changing injustices in her own community and seeks to be a role model for children in her pueblo. After pursuing higher education, Chavez hopes to return home to New Mexico and run for office in the future. While at SAR, Chavez will be working on various projects relating to education, registration, and collections management. Lilyan Jones is a member of the Seneca Nation and a recent graduate of Colgate University in New York. She is the daughter of a Seneca cultural researcher and Onondaga potter and clay sculptor. 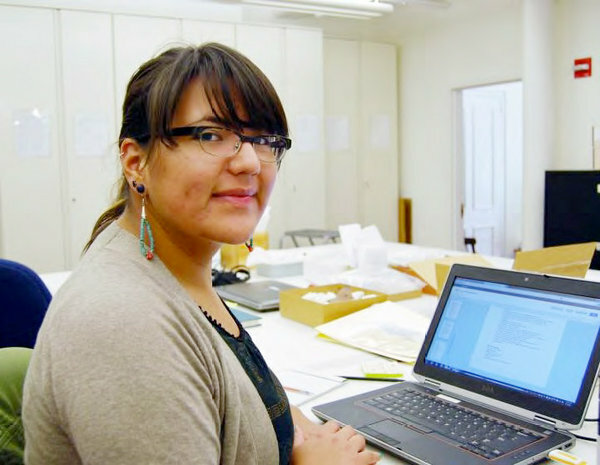 Throughout her four years of study at Colgate University, Jones assisted the curator at the Longyear Museum of Anthropology. Most of her work focused on the Native American and Pre-Columbian collections, which number over 15,000 art and archaeology objects. She gained extensive first-hand experience with aspects of maintaining a small museum, from planning openings to managing collections. In her senior year, Jones and another student organized an exhibit, “Local Legacies,” which focused on Haudenosaunee (Iroquois) art and culture from ancient times to the present. The exhibit was displayed in the Village of Hamilton Public Library. In the summer of 2012, Jones interned at Harvard University’s Peabody Museum of Anthropology and Ethnology, conducting research and developing multi-media presentations for use in an Alaskan kayak exhibit, the Kayak Conservation Project. This work involved developing a slideshow, as well as creating informational posts and a section of frequently asked questions and answers for social media. She also conducted research in the provenance of kayaks, relevant historical photographs, and similar objects in other museum collections. 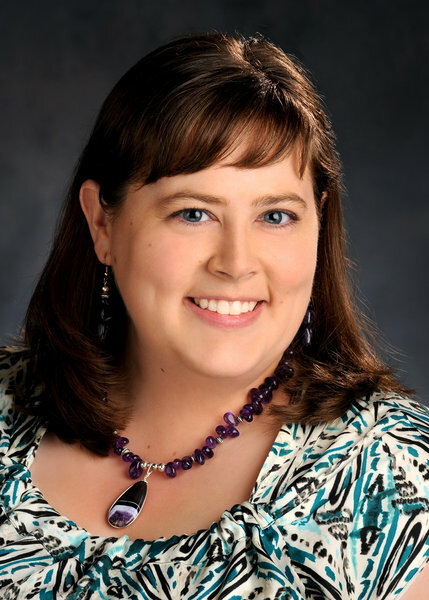 During her tenure at SAR, Jones will spend half of her time working on collections/registration projects and the other half working on academic/programming projects. She will be in residence at SAR from September 2, 2014-May 31, 2015. Lilyan Jones. Photograph courtesy Lilyan Jones.